Located a 10-minute walk from Myoko Ikenotaira Ski Resort, Ikenoya Ryokan offers reasonably priced Japanese-style guest rooms and natural hot spring baths. 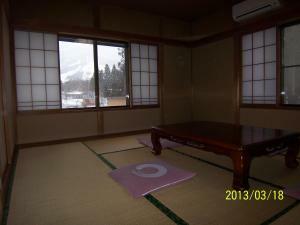 Each room is fitted with tatami (woven-straw) flooring and traditional futon bedding. It features a TV, a telephone and free Wi-Fi. Bathroom and toilet are shared. Imori Pond is 3 minutes walk away and several restaurants are nearby. Landmark Onsen Cafe is a 5 minute walk from Ikenoya. Ikenoya provides free luggage storage services. Guests can unwind in hot spring baths or rent a bicycle to explore the area. Cross-country ski equipment can also be rented on site. Myoko Kogen Golf Resort is a 5-minute drive away, and Akakura Golf Courses are a 13-minute drive from the property. Japanese meals are available for dinner and breakfast at the dining room. 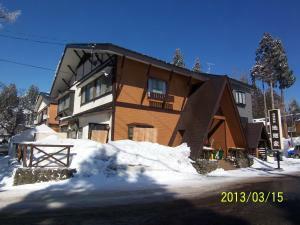 The property offers a free pick-up service from JR Myoko Kogen Station when requested 3 days in advance.